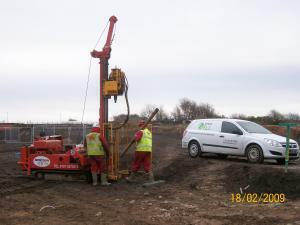 VertaseFLI was contracted to undertake remediation of a BTEX groundwater plume in Cumbria. The site is an active local authority allotment scheme with over 30 live plots. It was necessary to work closely with the allotment holders to ensure minimal disruption to them without compromising the objectives of the remediation. 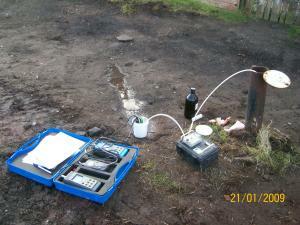 The historic site investigations completed by others identified a very generalised plume over a very wide area. In order to identify the most appropriate remedial methodology and to delineate the plume more accurately, VertaseFLI conducted further, targeted intrusive investigations. This allowed us to collate site specific data for remediation scheme design and also confirm the presence of three distinct areas of maximum contaminant concentrations. An options appraisal was completed which confirmed air sparge with soil vapour recovery (AS/SVE) as the most appropriate and practicable method. Extensive discussions with the Environment Agency were held throughout the options appraisal process and especially in the context of validation portals and objectives. The site is adjacent to a SSSI and RAMSAR site. 74 sparge wells were extended at least 2m into the saturated zone with 107 shallow vapour recovery wells installed within and slightly beyond the three zones to ensure an effective radius of influence for vapour recovery. The exact extent of contamination (both laterally and vertically) was continually re-assessed during well installation to ensure proactive decisions were made based on site conditions. Construction programme dictated that all three zones be subjected to remediation simultaneously requiring pumps and blowers of considerably larger capacity than normal. The process plant was designed, built and maintained by our in-house mechanical and electrical engineers working out of our own workshop. After 10 months of active AS / SVE, over 4.9 tonnes of dissolved phase hydrocarbons had been mobilised and recovered from the plume. The remedial works are currently ongoing and performing to programme.